In a bawl take gram flour ,add chopped onion(optional) ,green chilli,chopped coriander leaves,salt ,cumin powder,turmeric powder,add some water, mix all of them and make concentrated mixture . In a pan heat the oil flame should be in medium .Once oil is heated properly start deeping small balls made from the gram flour mixture and slowly deep fry all of them .Once it turns golden brown take them out and keep on kitchen tissue paper to soak those extra oil from the pakodi. Mix 1 chopped tomato and add salt in the mixture. Let it cook for some time . Add coriander powder ,turmeric powder in it. In a separate bowl take 500 gm curd,add 1-2 spoon gram flour ,pour some water (200ml) .Now start stirring or grinding so buttermilk or thinner consistency of curd can be prepared . Now pour this curd mix in the same pan where tomato is cooked . Let the curd boil well n get mix with all the ingredients. Once curd is boil, deep those bhajiya’s (pakodi) in it. Cover whole preparation and cook for some more time. 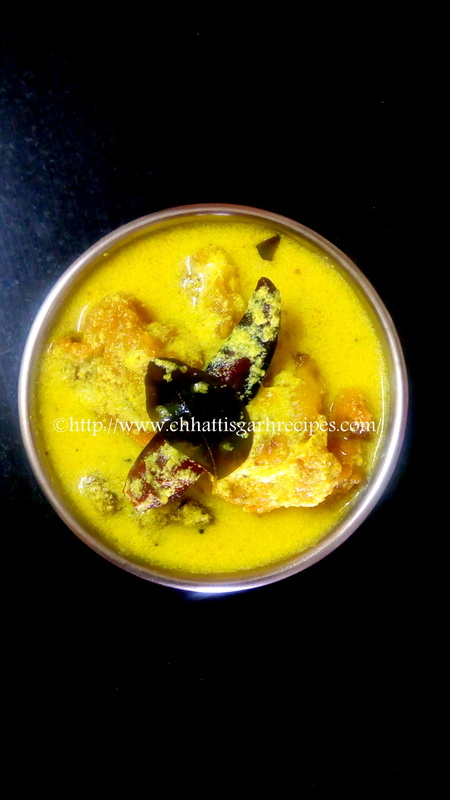 Bhajiya kadi is ready to serve with steamed rice. Note : Kadi is one of the important part of chhattisgarhi food tradition. Across India Kadi is famous and made by people by other states too .In chhattisgarh dependency on cow and its by products are more ,so practice of making kadi in lunch time is a tradition. सबसे पहले पकोड़ियों या भजिये की तैयारी करेंगे। इसके लिए एक कटोरे में बेसन ,कटी प्याज (इच्छानुसार) ,थोड़ी कटी हरी मिर्च ,हरी धनिया , नमक,हल्दी पाउडर , जीरा पाउडर डालें और पानी डाल कर अच्छे से फेंट ले. अब इस दही के मिक्स को कड़ाई के मसाले में मिला कर पकने दे. जब १-२ उबाल आ जाये तब पकोड़ियों को उबलते हुए दही में सीधे डालें और ढक कर पकने दें. जब पक जाये तो ठंडा करें और गरमा गर्म चावल के साथ मज़ा लें.